Establishment or grassroots? Clinton or AOC? It seems like CD-1 candidate Crisanta Duran can’t figure out what kind of candidate she wants to be, and that is pretty important considering her admission that there will not be much difference on how she would vote compared to the long-time Congresswoman she hopes to replace. While Duran out of the gate said that the district needed a new type of leadership after two decades of Diana DeGette’s service in the House of Representatives, the former State House Speaker has sure been hustling to line up establishment endorsements. The latest of which is probably the most establishment political figure in the entire state – although, also probably the most respected. Yep, Ken Salazar, former Interior Secretary, U.S. Senator, and chair of the Hillary Clinton Transition Team (yes, they tapped him to do this before the election – they were “so sure”) came out of Friday with his endorsement of Duran for Congress. 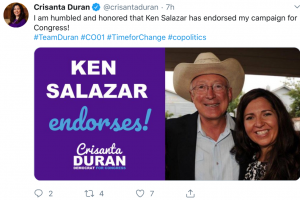 In a Democrat era where the cool kids are all eschewing any connections with establishment lawmakers – real or perceived – we find it odd that Duran would troll for such an endorsement, and then publicize it. This is especially ironic, given the outsider tone that Duran attempted to set at the outset of her campaign. Then, again, Duran announced it on a Friday afternoon – a typical end of week news dump. Whether that was her idea or Salazar’s is TBD. But ultimately we know exactly what this is. Duran’s campaign is simply an exercise of a candidate looking for an office. It’s nothing new – we’ve seen it on both sides of the aisle here in Colorado – but it has a very poor track record in this state. And we don’t see Duran changing that pattern any time soon, but we’re sure going to enjoy watching it go down.